Daniel Craig and Hugh Jackman star as a pair of Chicago cops in their new Broadway play. James Bond and Wolverine have hit Broadway. Daniel Craig and Hugh Jackman gave their first performance Thursday night in the play "A Steady Rain." In it, Craig and Jackman play Chicago police officers confronting professional and personal difficulties. The 90-minute play, which has just two characters, arrives in New York after a well-reviewed run in Chicago with a different cast in 2007. Craig and Jackman have significantly increased the star wattage of the production. 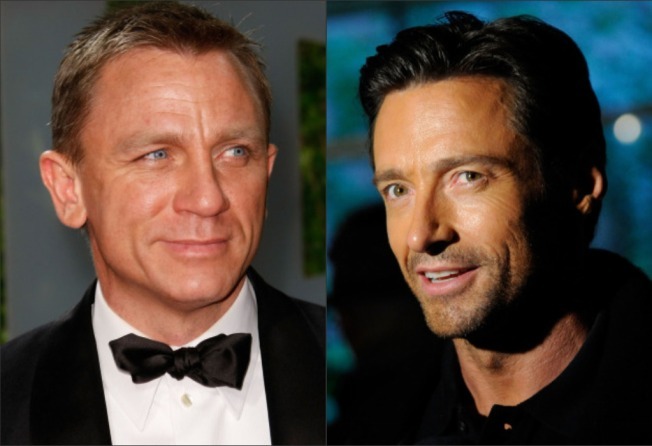 Craig skyrocketed to film stardom as the latest cinematic James Bond, and Jackman plays Wolverine in the "X-Men" movies. They drew a standing ovation from the sold-out Gerald Schoenfeld Theatre audience on Thursday. It was Craig's Broadway debut. Both have theater experience, too. Jackman is a Tony winner for his performance in "The Boy From Oz." He also starred in "Carousel" at Carnegie Hall and "Oklahoma!" at the National Theater in London, among others. Craig is less seasoned on the stage but has starred in "Hurlyburly" at the Old Vic, "Angels in America" at the National Theatre and "A Number" at the Royal Court Theatre. "A Steady Rain" is remarkable for its staging — through storytelling and monologues — of material traditionally the domain of the movies. Both actors sit in and roam around chairs facing the audience to directly tell a tale that would normally befit the big screen, complete with car cashes and gun fights. Jackman performs with an Italian-American accent; Craig's character has an Irish-American accent. From interviews with audience members after the show, the crowd was impressed. "They were probably better than I expected," said Matt Serota, a young theatergoer from Long Island. "It was amazing how they were able to go from very docile to grab-your-throat (intensity) against each other, against the audience." Christine Martino and Caye Hursey, friends visiting New York from California, spilled out of the theater eagerly discussing the play. "The complexity of the story and their acting was amazing," said Martino. "I think that's why they did it — actors do this for themselves and to show other people what they can really do besides just the big-ticket stuff." After the play, throngs assembled around the stage doors. More than 100 people waited for glimpses of thetwo stars, including Jillian Smith, an Australian who was glad for the chance to see her "countryman," Jackman, on Broadway. Producers are hoping such enthusiasm for the two stars of "A Steady Rain" translates to big box office. The play will sport the highest regular ticket price for a play (not a musical) on Broadway. Top weekend tickets will go for $130 each, climbing to $140 Thanksgiving weekend and for Dec. 4-6, the final weekend of the production's 12-week limited engagement. "A Steady Rain," written by Keith Huff and directed by John Crowley, officially premieres Sept. 29.